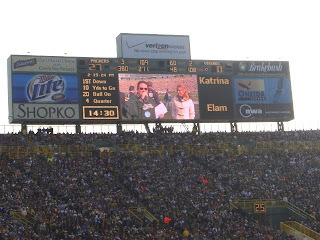 Lambeau Field will be filled with Green Bay Packers fans, all cheering on their Green Bay Packers. Will Aaron Rodgers play as well as he did this past season? We only have two wait two more days to find that out. More pressing is what will we hope to see from the Packers defense. They lost too many games by four points or less. We need a closer with that new 3-4 defensive scheme. Aaron Kampman will play from a standing position this season. The veteran corners are still with the Packers. We have seen some great performances by the linebackers this preseason. Our tight ends have also stepped up to the challenge. Now, the real test begins. We face the Chicago Bears who now have a gunslinger quarterback. Call our Ticket King Green bay office for last minute Packers ticket prices. We will be open on game day.